This entry was posted on March 8, 2010 at 1:26 pm and is filed under garden. You can follow any responses to this entry through the RSS 2.0 feed. You can leave a response, or trackback from your own site. It’s always like that with bargain stuff. 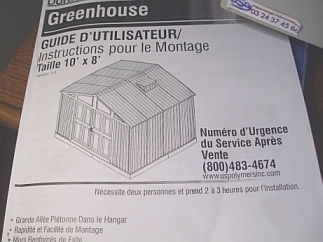 But it looks like a nifty little greenhouse. I’d like it! According to Guy a strong gust of wind might blow it away but I hope he was joking! Yes, Helen, it does look better now it’s up. What a good friend Guy is. Although I expect he started to wish he hadn’t offered to help! Good luck, Sandy. I gave away our greenhouse ten years ago as I would forget to water or water too much or something. Sorry it was such a nightmare to put up. Wow! 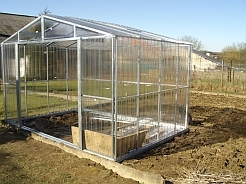 Lucky you, I’ve got a midget mini-serre from Lidl’s and it’s been great for the past 2 years, the 2nd year I put black plastic down first:) Mine has piquets anchoring it into the ground, but so far we haven’t had the high winds like at present during the time it’s been in use. I’m trying out some new seeds from the Real Seed company (online) which I had deleivered to Sorcha’s as it’s £7.50 postage to France. These are ones you can save the seed from, and are non-hybrid. This season should be interesting particularly as there will be fresh chicken s**t.
Gosh did you only get a quote for 2-3 hours work. Must have cost a bomb with labour charges. Every time we get something that has to be put together there is always something that does not fit. The quality control on these types of products is not “quality” usually. But your greenhouse looks good now.